Myanmar's military announced Friday that the Arakan Army, a Buddhist rebel group in Rakhine state, has been classified a terrorist organization after mounting a flurry of recent attacks. The state earlier was the site of a brutal counterinsurgency campaign by the military against the Muslim Rohingya minority, causing more than 700,000 to flee to neighboring Bangladesh, according to AP report. The insurgent group, which seeks autonomy from the central government, killed 13 police officers and wounded nine in attacks on Jan. 4. The moves to counter the rebels were decided at a Jan. 7 meeting at Myanmar's presidential offices, the officers said. 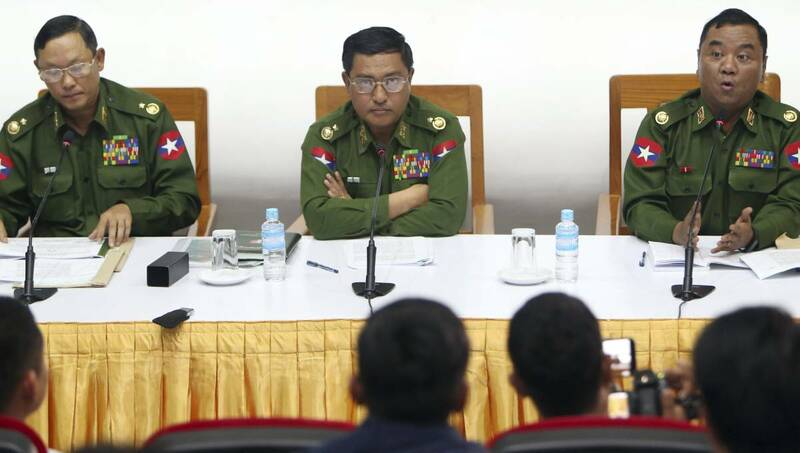 Suu Kyi "said the Arakan Army is just a terrorist group and instructed us to defeat them effectively, quickly and clearly," Maj. Gen. Nyi Nyi Tun, vice chairman of the Myanmar Military Information Committee, told reporters. A terrorist designation criminalizes a group and bans all communication with them. The military in Buddhist-majority Myanmar has been accused of ethnic cleansing, and even genocide, against the Muslim Rohingya. Its counterinsurgency campaign was triggered when a group of Rohingya guerrillas attacked security outposts in August 2017. Myanmar's military in December announced cease-fires in five areas where ethnic rebellions are active, but did not include Rakhine state because it had information that the Arakan Rohingya Salvation Army planned attacks, the officers said. At U.N. headquarters in New York, Secretary-General Antonio Guterres spoke about his "enormous frustration with the lack of progress" by Myanmar's government in creating conditions for the return of the more than 700,000 Rohingyas who fled to Bangladesh in 2017 and are living in "extremely difficult circumstances." "It is absolutely essential to create the conditions of confidence and trust," he told a news conference. "It's not only physical reconstruction, it's a matter of reconciliation of communities and strong commitment by the government for that reconciliation of communities to be possible, and for the safety of the Rohingya population to be guaranteed." "Unfortunately, the truth is the situation on the ground has not been conducive to it. Things have been too slow," he said. "One of the dramatic aspects when you fail in solving the root causes of the problem is that violence then tends to erupt again, and that's what we have seen recently in Myanmar." "We insist in the need to create conditions for them to be willing to go back" to Myanmar, Guterres said. One of first steps could be to solve the problem of the Rohingya who are internally displaced which would "give credibility" to future returns, he said.